At the MVP Level, players will begin competing more frequently in order to apply and refine the skills they have developed. Players will also begin to specialize and fit into more specific roles and positions. Team tactics and game strategy will also be further implemented in the MVP Level. Positive Coaching Alliance encourages you to understand the different types of leadership. There are quiet leaders, who most often lead by example. Seeing those players giving their all, teammates are bound to follow. There also are vocal leaders, who say the right things at the right times and may even yell to get their teammates excited and to create a sense of urgency for all the players on the team to boost their levels of energy and effort. Players who understand the different types of leadership can begin to try those different leadership roles on for size and see what type of leader they want to be and can be. Have the players get a ball and find a line on the court. The players will put 1 foot on each side of the line with their knees bent in a good stance. The player will then dribble the ball with the right hand on the right side of the line, as the ball comes up, the player will control the ball so that the next dribble will bounce on the left side of the line. The player will dribble the ball on a different side of the line on each dribble using only 1 hand for the allotted amount of time and then switch hands and repeat. Have the players partner up and share a basketball. 1 partner will dribble the ball while the other partner will put their arm straight out in front of the dribbler at about waist level. 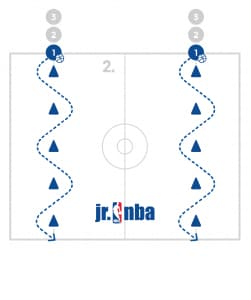 The dribbler will take 1 or 2 dribbles and then make and in and out dribble move that must go over the top of the players arm and then bounce under their arm and back to the same hand it started in. The players will do this for the allotted amount of time before switching hands and roles. Divide the group into even groups. Place five cones from sideline to sideline in a straight line for each group. The first player in each line will have a ball. The player will dribble through the cones in a zig-zag motion all the way past the last cone. After the player in front of them has gone through a 2-3 cones, the next player in line can begin. Make sure on the way back to work on the move starting with the other hand. Make sure the players are staying low and controlling the dribble. The players should also be pushing off their outside foot to change directions. Have the players partner up and get two balls per pair. One player will dribble one ball in one hand. The other player will toss the other ball to the dribblers other hand. The dribbler will control the catch and toss it back. Repeat this action with both hands and both players. Keep the drill fresh and challenging for the players by mixing in a tennis ball or having the players make a dribble move before catching the ball. Make sure the players control the 2nd ball with soft hands and don’t simply smack the ball back to the partner. Have the players divide into small groups and find a basket and 1 ball per group. Each of the players in the group will shoot 3 reps of 4 types of floaters. The first set of 3 shots for each player will be a floater with the right hand off the left leg. After the players have rotated through taking 3 each, they will change to using the left hand off the right foot. Next the players will take floaters off of two feet using their right hand for 3 reps each, then their left hand for three reps.
Divide the players into groups of 4 and start with 1 team on defense and one team on offense. The offense should only have players on the perimeter and no post players. The offense is only allowed to pass and cut (no screens). After 5 passes, the ball will become live and the offensive team can try to score but are still not allowed to screen. The possession ends after the defensive team gets a rebound. Switch teams by having the defense step off and the offense go to defense after every possession. The first team to get 5 defensive rebounds will win. Have a line of players on each wing. There should be an offensive and defensive player on the court. The defensive player will deny the offensive player the ball for 3-5 seconds. After that, the defender will go to the back of the line. Next, the offensive player will become the defender. A new player will step in on offense and the process will repeat. Make sure the players see the ball and the man. If the offensive player receives a pass, the defensive player must repeat. If the offensive player cuts back door, the defender must snap their head and hand in the other direction quickly. 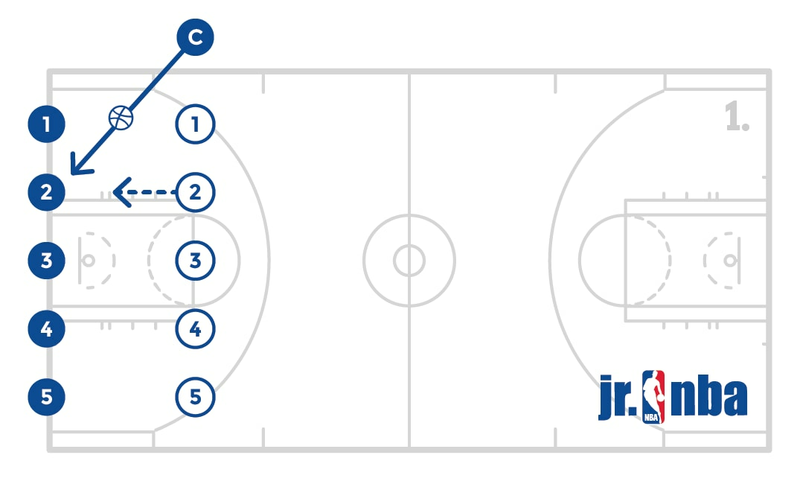 Have a line of players on each wing with a ball and a coach at the top. The defensive player will deny the offensive player the ball for a few seconds and the coach will try to make a pass to the offensive player. The defensive player will deflect the pass and go the other direction for a contested layup. The offensive player will try to get open. Once the defensive player has made the deflection and gained possession of the ball, the former offensive player will then try to defend the layup going the other way. Start with a player on each wing and a player at the top. There will be a player in the paint who will start as defense. Utilize other court space or baskets as needed or have additional players join the end of the line on the wing. The defensive player has to get 3 defensive 1 on 1 stops. They will first defend the player on the wing until they get a stop, then move to the top until they get a stop and then finish with the opposite wing before being done. After the player gets their third stop, the players will rotate so that the defender goes to the back of the line on the wing, the player at the front of that line will move to the top, the player at the top will move to the opposite wing, and the player from that wing will move to defense. 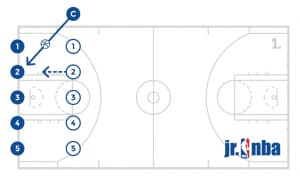 Divide the players into teams and have 5 players line up across the baseline and 5 players line up on the free throw line extended across from them. The coach will have a ball and pass it to a player on the baseline and that player and that team will go to the other basket to try to score. 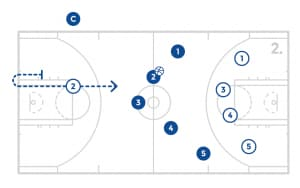 The player that is standing free throw line extended in front of the player who caught the ball will have to sprint to the baseline in front of them and turn and sprint back into the play which is now ahead of them. The defensive team will need to stop the ball and match up as they are at a 5 on 4 disadvantage until the player hustles back into the play. After the possession, have the teams switch (baseline to free throw line extended and vice versa) and continue the drill. Coach the players through the proper method of stopping the ball and matching up. The team with the set number of defensive stops first wins. Have two lines on the baseline near the sideline with one slightly closer to the top of the key. Both lines will have a cone between above the three point line but before half court directly in front of them. The line closer to the sideline will have a ball. 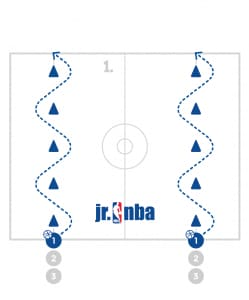 On the coaches command, the first two players in line will go to the cone and around them towards the middle of the court. The player will the ball will dribble the entire way and upon going around the cone, the players will play 1 on 1. After the possession, the next 2 players in line will begin the same process. This should be a fast pace game. Be sure to utilize the other side of the court or other baskets to maximize reps.
Divide the players into two or more teams and have one be offense and one be defense at a basket. The team on offense will play a possession of offense starting in the half court. If the offensive team gets the rebound, they can continue to try to score, if they score or the defense gets a rebound or a steal, they will play live for a possession going the other way. After that possession, the game is still live and the team that started with the ball will bring it back down to the basket they started at. 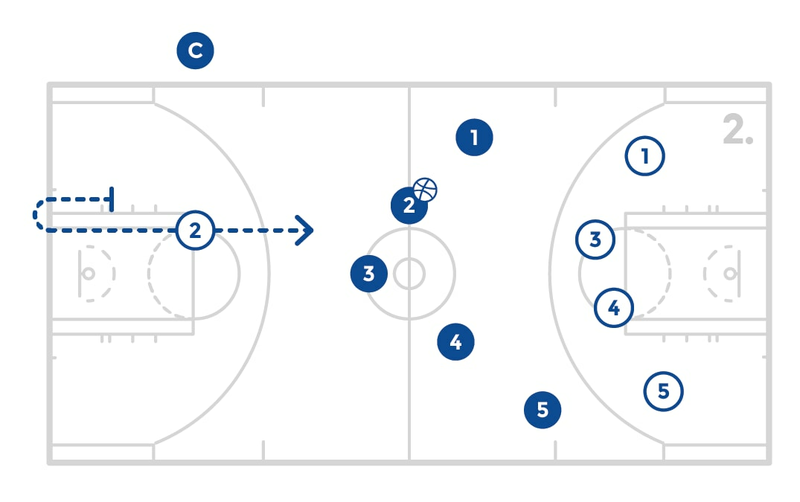 After this possession the 3 trips are over and the teams will switch so that the other team starts with the ball in the half court. Play the game to the allotted number of baskets. As the coach, you can dictate a play or a particular action you want the players to execute as they compete in the half court or 2 full court possessions. Divide the players into teams and play 5 on 5 full court. Play games of 4-minutes to ensure the players play hard the entire game. In this version of 5 on 5, if there is a coaching point, stop the game and make the point before continuing. Gather the players in the middle of the court and encourage them to raise their hand and give another teammate a compliment. If needed, have the coach start the session by giving a compliment and let the players follow. All compliments should be natural. Not every player has to give or receive a compliment. At the conclusion of the MVP Level, Jr. NBA players should be proficient at each of the following skills. Judging proficiency at this level is the responsibility of the coach.